De Vries Shields Chiat Incorporated, or DSC Attorneys, is an established team of attorneys that specializes in the fields of personal injury claims, medical malpractice cases, “slip & trip” claims, as well as road accident and aviation related claims. DSC Attorneys firm was established in 2004 through a merger of three firms – De Vries Inc, Mostert & Bosman and Henry Shields Chiat – each with a previous, long-standing history of successful litigation. Their combined experience means clients are afforded the very best in specialized legal assistance. 3 Why choose DSC Attorneys? DSC Attorneys believes in promoting a client’s right of access to justice by offering to act on a “no-win-no-fee” basis. This means that DSC carries the often significant expenses involved in litigating a claim, right through to its conclusion. DSC’s profile and track record also mean that our clients gain access to our extensive panel of top medico-legal and other specialists and advocates. Medical malpractice: A highly specialized field, medical malpractice litigation has rules of procedure that differ from those for other areas of law. DSC Attorneys are well equipped to help if you believe you may be a victim of medical negligence. Motor vehicle accidents: Many South Africans have experienced difficulty in claiming from the Road Accident Fund (RAF). DSC is always up to date with the latest in road accident legislation and can help you if you’re injured in a motor vehicle accident for which you’re not solely responsible. Metrorail/train accidents: If you or your dependant has been injured in a rail accident, you may have good cause for claiming damages. Any injury sustained due to negligence on the part of Metrorail, whether on-board or while boarding or disembarking a train, could lead to a successful claim. “Slip & Trip”: DSC is often sought out by people who have suffered falls in shopping centres, convenience stores or restaurants, due to slippery floors, unmarked stairs or other forms of negligence. 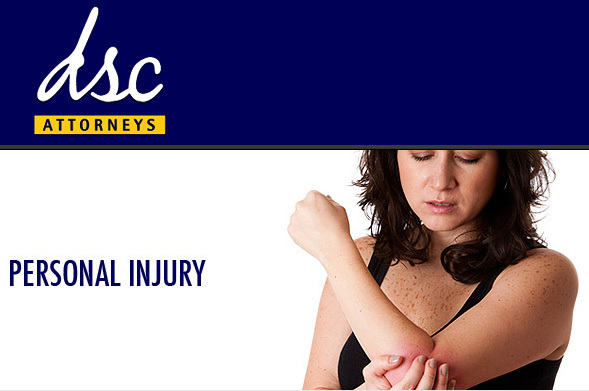 DSC Attorneys is an established leader in the specialized field of personal or fatal injury litigation. The firm is a member of the Cape Law Society, and partners with the AA and Discovery Health. Its multi-talented team of attorneys can meet a wide range of legal needs, with a focus on putting clients’ interests first. DSC Attorneys treats every case with the respect and dignity it deserves, offering each client the care of highly experienced specialist personal injury attorneys. This page was last modified on 23 April 2013, at 18:48.